Measuring change in myself. The objective of self-care is for individuals to make adjustments to their daily practices. In this it will be helpful to record self-care activities, and outcomes. Needed here is an introduction to technologies of potential self-care use – diagnostic tools (eg blood pressure monitors), devices (eg pedometers) and programmes (eg smartphone apps). If you are an expert in these areas and can help, please get in touch via admin@isfglobal.org . 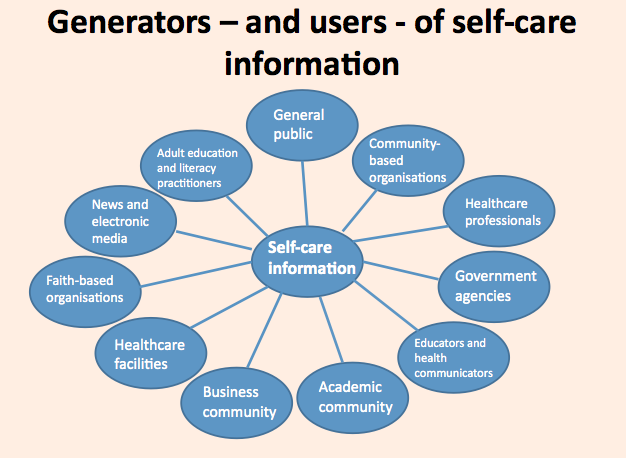 There are many generators, and users, of self-care information. All need authoritative, evidence-based information.